Phew – what a weekend! But what a success! It’s been hard work to organise and take responsibility for 7 races, a campsite, event village (and of course a sports centre) this weekend but what a weekend it’s been. Huge thanks to the enormous team of volunteers who have marshalled, timed, set up, packed up, put out route signs, registered runners and marshals, helped with catering, played bagpipes and drums …..and just supported in so many ways. Around 150 people have given up some or all of their weekend voluntarily (ie: without pay!) 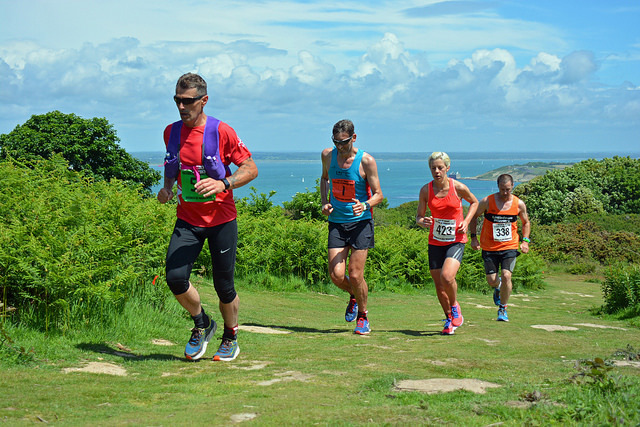 to help us make the first Isle of Wight Festival of Running happen. You are all amazing and it will be impossible to thank each of you individually so please read this and consider yourselves thanked!! An amazing example of teamwork and community spirit . THANK YOU FROM ALL OF US AT WEST WIGHT SPORTS AND COMMUNITY CENTRE. And to the runners…you are what inspires us…thank you for your support of the first Isle of Wight Festival of Running. Around 800 runners of all ages and abilities took part in events over the 3 days. Congratulations to all of you. We have some fabulous feedback and after a couple of well deserved days of rest, the organising committee will be getting back together to start planning next years event! So stayed tuned for more details.